Ski Lodge Aigle is in a perfect spot for keen skiers, families and party animals alike. It’s situated just off the first roundabout as you’re coming into Tignes le Lac and just 10m from the slopes. To access the ski lifts in the morning as well as the bars at night it’s just a short walk down a hill into town (2 to 3 mins walk), there is even access here for the main gondola that take you up towards Val d’Isere. 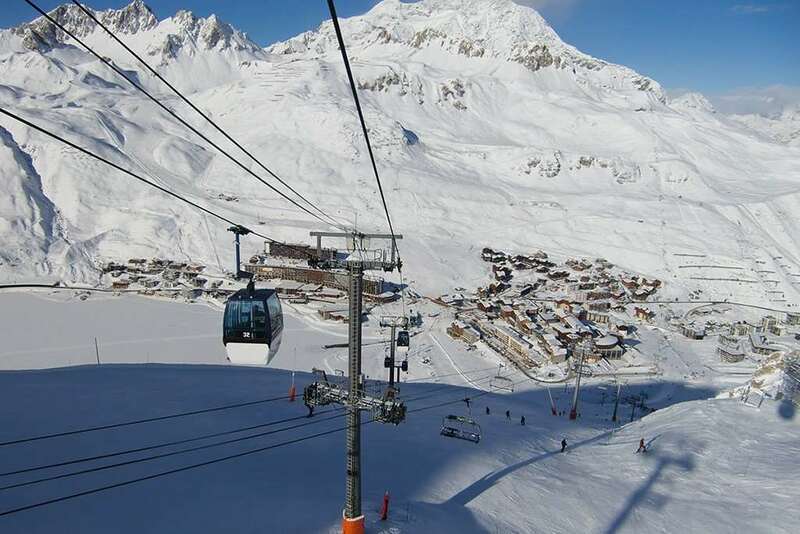 From the top of that gondola you can either head down the back of that mountain into Val d’Isere or traverse across and down into Tignes Val Claret where you can head up to 3656 meters to the top of the snow-sure Grande Motte. The Ski Lodge has a small bar for the guests only where you can buy drinks in the evening. The hotel is a modern and attractive building with a small pool and sauna. The Espace Killy for me offers some of the best skiing in the world for all standards. You can easily book yourself a guide that can take you to untracked slopes and places where the average skier won’t be able to find….secret spots that only a local will know! Remember keep safe and rent a local professional. The Ski Lodge is the fantastic base for all Tignes adventures. The Ski Lodge Aigle has proven to be exceptionally popular with guests since it was first introduced a few years ago and early booking is essential. Built in a modern Savoyard style with a wood/stone exterior and tastefully decorated throughout, it has a spacious dining area, sunny terrace (complete with deckchairs) and a great bar to relax in after a day exploring the vast Espace Killy ski area. The Aigle offers a very high standard of facilities including modern ensuite rooms, most with balconies, satellite RV in the lounge, a lift and an indoor swimming pool and a sauna, all for exclusive use by guests. Ski Lodge Aigle is in an unbeatable location perched on the hillside just 140 metres (approx) from the slopes, and intermediate skiers and aboce can ski back to the chalet at the end of the day. The centre of Tignes Le Lac and its bars and nightlife are approximately 5 minutes walk away making this a superb choice for your holiday. A dedicated Snow Concierge to help with all things snow related; whether it be booking ski school, or advising on the best runs on the mountain. Bath and hand towels (changed midweek), pool towels and L'Occitane shower gel and soap Look out for even more perks in each of the Lodges on the relevant property pages. Room 32 = small twin with shower, WC and shared balcony (under eaves). Breakfast is a hearty affair with a cooked option plus pastries, ham, cheese and fruit. No wine is included with dinner but is available at a reduced price. · 7 days of breakfast, including 6 cooked and 1 continental breakfasts. · 6 days of 4 course evening meals including cheese board. I booked a ski trip to Tignes through Iglu Ski- after not getting very far by looking online myself. We stayed in a delightful lodge which was an easy walk from the slopes. The weather was beautiful every day and Tignes plus the vast Espace Killy provided extensive and varied pistes for all abilities - although Tignes maybe not be the choice resort for total beginners. We have just returned from a week stay in Chalet Aigle and it was fabulous! Tignes is an amazing resort and I'm sure I don't need to say an awful lot about the ski area as it has been discussed thousands of times, but Chalet Aigle however is fantastic. The employees do a brilliant job. We stayed in room 25 which is small and comfortable but more than adequate for a couple on a weeks holiday. Showers were always hot and there is the added bonus of a pool and sauna in the chalet. Food was great; breakfast was continental plus a hot cooked option every day, the cakes at afternoon tea were lovely and dinner was 3 plentiful courses (with choices) with aperitifs and canap&#233;s beforehand and cheese afterwards - we never went hungry! The location is excellent - a piste runs immediately to the rear of the property (which takes you down to the Chaudennes and Paquis lifts) so it is a very short walk to join it in the morning and you can ski pretty much back to the door at the end of the day. The only downside to the week was that several guests who hired skis were recommended Inter Sport had their skis stolen and had to pay large amounts of money to Inter Sport (even if they had taken out the insurance - €200 rather than €750) It all felt rather too suspicious when on visiting the police station to report the theft, one guest found 10 other Inter Sport customers reporting the same thing! This is obviously not their fault (and they assured us that they probably won't be recommending Inter Sport anymore), but it is worth being aware of - take ski locks with you! Overall I would highly recommend both Chalet Aigle if you are planning on visiting Tignes.